This marinade veggie salad recipe is provided courtesy of Courtesy of Chris Mosler at Thinly Spread. It’s always good to give those vegetarians an option on the barbecue. Veggie burgers get a little boring and they’re not that great anyway, in my opinion. 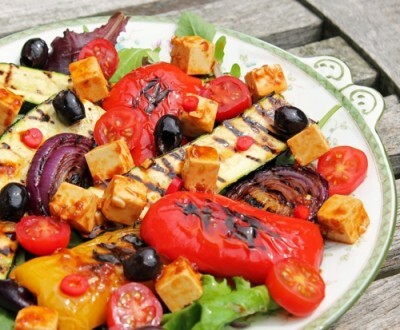 If you’re grilling for vegans you need to keep in mind that if you put together a grilled vegetable salad and add olive oil and some good spice, maybe even hot pepper for the right people, it will be a full meal on it’s own. And for professed vegetarians (as opposed to vegans – important distinction), just sprinkle cheese on top for the full meal deal. This recipe calls for a marinade and provides a recipe for making it yourself. If you prefer you can buy pre-made marinades. I’ve listed several of my favorites below this post. The great thing about marinades is that with a veggie dish you can still use a steak or chicken marinade and it will taste great. 100g Apetina cheese cubes (or Apetina cubed by your own fair hand. I love the little pots the cubes come in though, they have their own little baskets inside so you can lift the cheese out of its preserving water and then return what’s left to its little bath!) Vegans can substitute Tofu. Heat up the barbecue, a griddle pan, or your grill until nice and hot (if you’re using a pan it should be smoking!) and lay the slices on, turning them until they are browned and softened but not limp and pathetic…this is a salad with oomph remember! Do the same with your red onion. If you are barbecuing this can be problematic as the little devils fall down between the bars so they are best done in a griddle or under the grill! Add them to the peppers and courgettes and leave to cool.